Click on the links below to hear two rare radio broadcasts featuring ’Cile Turner. 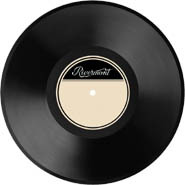 These unrestored recordings are taken from 12-inch metal-based 78 rpm lacquer discs and are not included in the Makin' Glory CD set. These selections are from live broadcasts of the WLVA Christmas Party, an annual radio fundraiser in Lynchburg, Virginia to buy gifts and food for the needy. Click on each link to listen in your web browser. To download the MP3 files to your computer, Macintosh users should hold down the control key while clicking on each link; on Windows, right click and select "Save Target As."